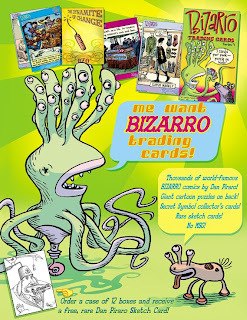 I'll be selling my new Bizarro Trading Cards, as well as my books and some one-of-a-kind sketch cards. I'm also doing a presentation on Saturday afternoon which will be as much like a comedy show as possible in a brightly-lit hotel conference room in the middle of the afternoon. "Why are you doing this, Dan?" the creepy voice inside my head is saying. Because contrary to popular belief, "rich" does not always go with "famous." I'm a little famous now and then, here and there, but if I were rich would I be sitting behind a folding table all weekend signing stuff? YES! Because I LOVE THE FANS! So come see me, and tell me you found out about it on this blog and I'll give you a peanut! If I have one. P.S. Click on this image for a larger version. The note at the bottom of the ad refers to comics shops who carry cards. 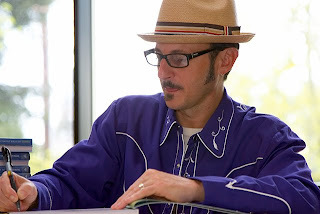 You can buy a sketch card from me at the show, which I will draw in front of your eye. Both eyes, if you like. I live in jamaica( although i haven't realized it yet), and am too young to go there anyway ( not that young btw). 'Tis a sad life this strange girl lives. Hope you have many polite, friendly, only slightly crazy, and spendthrift fans attend! Ever since Neatorama mentioned that you were doing stand up I've been dying to catch you do your act. I'm hoping our travels will intersect some day! Some day!